Hello again. I only have a few things to discuss this month. There was a discussion at Dinar Vets about our friend Marcus Curtis’ post a while back entitled “Trials for Dinar Holders“. In that post MC postulated that Iraq was actually using dinar sales to feed their foreign currency reserves, and that there are about 25 trillion dinar in the hands of speculators. The responses were predictable. “He’s a guitarist and an armchair economist” …. “That was before Maliki was removed” … “It’s just a blog; he ddn’t even bother to purchase a domain name” … etc. No real discussion occurred as to the links Marcus provided or the facts he presented. First of all, the fact that he plays the guitar has nothing to do with whether or not his analysis is valid. After all, what qualifications does Adam “Wolfyman” Montana or any other guru have? What matters is whether or not his theory holds water, and if it’s based on facts. Second, as I’ve mentioned for some time Maliki has nothing to do with whether or not there’s an RV. He’s been gone for four months and no RV. I’m confident that four months or four years from now there still won’t be any RV of the IQD. Nothing more than a few % anyway. The bloated money supply of the IQD is the issue, not Maliki or Obama or Madame Wu or anybody else. It’s about the numbers. And third, Marcus has never run any ads or made any money from his site, so why should he purchase a domain name? And again, domain name or no domain name … what counts is facts. It’s a fact that the CBI financials show 34 trillion dinar outside of banks, and that less than 10 trillion can be accounted for within Iraq. It’s a fact that their money supply steadily increased from 2004-2013. (It seems to have stalled over the past year or so. By a strange coincidence dinar sales have really fallen during that time. 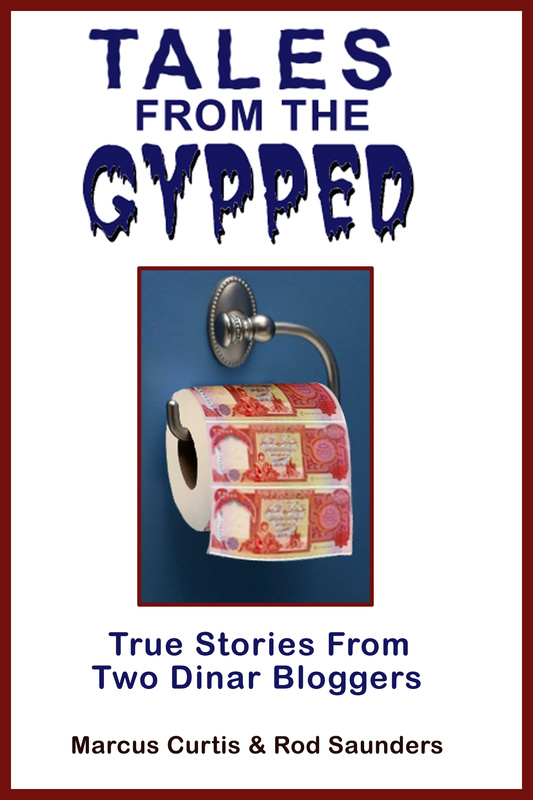 Dealers don’t really need to buy from out of country any more because they can get all the dinar they want from disillusioned specuators, which would support Marcus’ theory that they have used the sale of dinar to grow their foreign currency reserves. No dinar exports for USD = no FCR growth = no expanding money supply. With fewer USD flowing into Iraq for oil due to lower oil prices, and with fewer USD being exchangd for IQD, my guess is that the market value of the IQD will take a hit in 2015 which could trigger another round of inflation, which ironically enough could lead to an increase in the official value of the IQD from its currenct value of $.000857. I wouldn’t be surprised to seem them bump the value up a few % next year. Anyway, back to the original topic.) And it’s also a fact that dinar from outside of Iraq wasn’t accepted during the previous two currency changeovers in Iraq. Marcus provides links for all of that. So LAC (the lady who asked if there was anything to what Marcus said) take note of the fact that nobody who responded to you dealt with any of these facts. Then form your own conclusions. On Nov. 17 Breitling said that in the last five or six years the dinar has gone up 26% while the S&P has only gone up about 12%. I thought it might be nice to look at some charts to see if there’s anything to this. As you can see the S&P six years ago was at 903, and today it’s at 2041. That would be an increase of 126%, or about 21% per year. Now let’s take a looksie at the dinar. 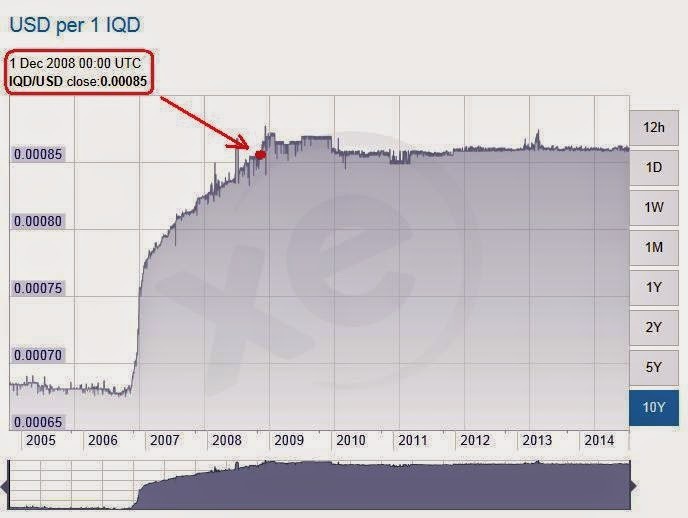 As you can see, the dinar was at $.00085 six years ago and today it’s at $.000857 which is an increase of about 8/10 of 1%, or about .0013% per year. While I’m talking about B, let me issue a reminder about his claim that the Ministry of Planning’s feasibility study told us that they’re going to raise the value to $1 and eventually $3. That study said that they recommended REDUCING the exchange rate from $3.20 to $1.13. The IQD was never valued at more than a tenth of a penny. The feasibility study is from the Saddam era and is 100% irrelevant. The issue that they were addressing was that depreciation of the Saddam dinar during the 80s had rendered the $3.20 valuation obsolete. It turns out that the study was from 1984 and was revised in 1990. As our friend Brian has pointed out more than once, basing your dinar speculation on this feasibility study makes about as much sense as shopping for a house based on real estate prices from the ’70s. I wrote about this two Decembers ago. The truth is things are really bad in Iraq, what with ISIS controlling a good amount of the country and sectarian division and all. This slump in oil prices (remember that oil revenues account for nearly 90% of their GDP) only makes things worse. The gurus won’t tell you this of course, but I will. Right about now anybody with any sense who has dinar ought to be questioning this “investment”. Don’t worry, you’re not alone. I went through the same epiphany a little over three years ago, and many of my readers did as well. We all make mistakes in life. The important thing is that you learn from them and move on. And finally, I’d like to issue my annual reminder that the gurus love to predict an RV by the end of the year, and they’re ALWAYS wrong. They’ll be wrong this time, too.